* A comprehensive guide to the film noir genre and how to capture its black & white feel in your game. 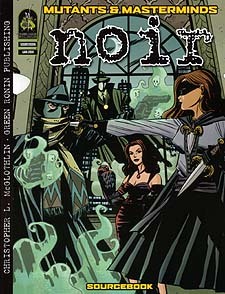 * Rules for creating Noir characters, including skills, new feats, and adjustments to powers, as well as new systems for wealth and reputation. * A guide to Noir technology, gadgetry, and guns. * The Asphalt Jungle, a complete Noir setting, suitable for use with any campaigning, including notes on how to add film noir elements to Freedom city. * They Live by Night, a collection of the most dangerous dames, criminals, and would-be heroes in the shadowy world of Noir, all usable in any Mutants and Masterminds game. * A filmography and guide to film noir to inspire your own adventures. * Plus a special bonus: a feature on the Scorpio circle of 1930s Arcadia, featuring META-4 characters like the Pugilist and the mysterious Mr. Mystery! Written by Christopher McGlothlin, award-winning author of Time of Crisis, Noir has everything you need to take your Mutants & Masterminds game for a walk in the shadows on the wrong side of the tracks. So grab your trenchcoat and your gat, and step into the dark and dangerous world of Noir.